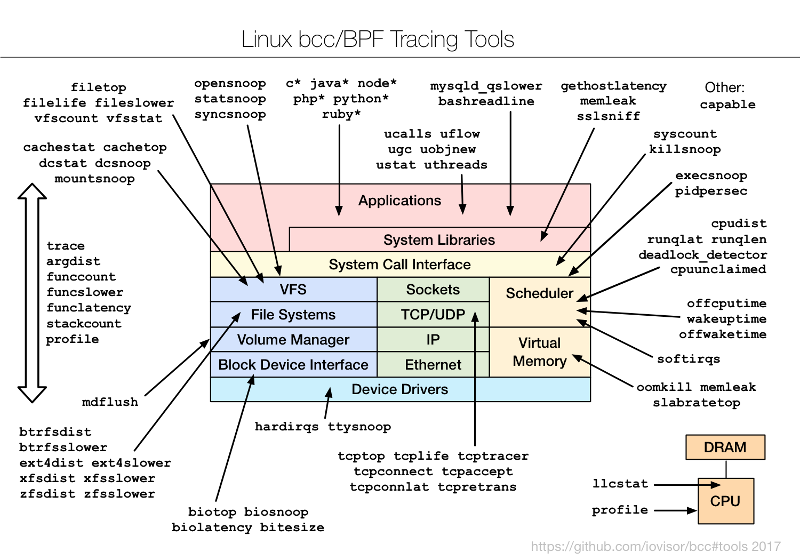 Look deeply into your Linux code with these Berkeley Packet Filter (BPF) Compiler Collection (bcc) tools. A new technology has arrived in Linux that can provide sysadmins and developers with a large number of new tools and dashboards for performance analysis and troubleshooting. It's called the enhanced Berkeley Packet Filter (eBPF, or just BPF), although these enhancements weren't developed in Berkeley, they operate on much more than just packets, and they do much more than just filtering. I'll discuss one way to use BPF on the Fedora and Red Hat family of Linux distributions, demonstrating on Fedora 26. Advanced performance tracing tools: programmatic low-overhead instrumentation of filesystem operations, TCP events, user-level events, etc. BPF programs must pass an in-kernel verifier to ensure they are safe to run, making it a safer option, where possible, than writing custom kernel modules. I suspect most people won't write BPF programs themselves, but will use other people's. I've published many on GitHub as open source in the BPF Compiler Collection (bcc) project. bcc provides different frontends for BPF development, including Python and Lua, and is currently the most active project for BPF tooling. These are command-line interface (CLI) tools you can use over SSH (secure shell). Much analysis nowadays, including at my employer, is conducted using GUIs and dashboards. SSH is a last resort. But these CLI tools are still a good way to preview BPF capabilities, even if you ultimately intend to use them only through a GUI when available. I've began adding BPF capabilities to an open source GUI, but that's a topic for another article. Right now I'd like to share the CLI tools, which you can use today. Wow. What is all that? What is grepconf.sh? What is /etc/GREP_COLORS? And is grep really reading its own configuration file ... by running grep? How does that even work? Welcome to the fun of system tracing. You can learn a lot about how the system is really working (or not working, as the case may be) and discover some easy optimizations along the way. execsnoop works by tracing the exec() system call, which is usually used to load different program code in new processes. opensnoop works by tracing the open() syscall. Why not just use strace -feopen file ...? That would work in this case. A couple of advantages of opensnoop, however, are that it works system-wide, and tracing open() calls across all processes. Notice that the above output included opens from systemd. Opensnoop also should have much lower overhead: BPF tracing has been optimized, and the current version of strace(1) still uses the older and slower ptrace(2) interface. In the output above, I caught many cksum(1) reads ("T" for type == "R") with over 1 millisecond latency. This works by dynamically instrumenting kernel functions in XFS while the xfsslower tool is running, and it undoes that instrumentation when it ends. There are versions of this bcc tool for other filesystems as well: ext4slower, btrfsslower, zfsslower, and nfsslower. This is a useful tool and an important example of BPF tracing. Traditional analysis of filesystem performance focuses on block I/O statistics—what you commonly see printed by the iostat(1) tool and plotted by many performance-monitoring GUIs. Those statistics show how the disks are performing, but not really the filesystem. Often you care more about the filesystem's performance than the disks, since it's the filesystem that applications make requests to and wait for. And the performance of filesystems can be quite different from that of disks! Filesystems may serve reads entirely from memory cache and also populate that cache via a read-ahead algorithm and for write-back caching. xfsslower shows filesystem performance—what the applications directly experience. This is often useful for exonerating the entire storage subsystem; if there is really no filesystem latency, then performance issues are likely to be elsewhere. Although filesystem performance is important to study for understanding application performance, studying disk performance has merit as well. Poor disk performance will affect the application eventually, when various caching tricks can no longer hide its latency. Disk performance is also a target of study for capacity planning. This is another useful tool and another useful example; it uses a BPF feature called maps, which can be used to implement efficient in-kernel summary statistics. The transfer of data from the kernel level to the user level is merely the "count" column; the user-level program generates the rest. That they behave like other Unix tools is by design, to aid adoption. Before you say: "Can't I just scrape tcpdump(8) output for this?" note that running tcpdump(8), or any packet sniffer, can cost noticable overhead on high packet-rate systems, even though the user- and kernel-level mechanics of tcpdump(8) have been optimized over the years (it could be much worse). tcplife doesn't instrument every packet; it only watches TCP session state changes for efficiency, and, from that, it times the duration of a session. It also uses kernel counters that already track throughput, as well as process and command information ("PID" and "COMM" columns), which are not available to on-the-wire-sniffing tools like tcpdump(8). Here I'm tracing libpam and its pam_start(3) function and printing both of its arguments as strings. Libpam is for the pluggable authentication modules system, and the output shows that sshd called pam_start() for the "root" user (I logged in). There are more examples in the USAGE message ("trace -h"), plus, all of these tools have man pages and examples files in the bcc repository; e.g., trace_example.txt and trace.8. The best way to install bcc is from an iovisor repository, following the instructions from the bcc INSTALL.md. IO Visor is the Linux Foundation project that includes bcc. The BPF enhancements these tools use were added in the 4.x series Linux kernels, up to 4.9. This means that Fedora 25, with its 4.8 kernel, can run most of these tools; and Fedora 26, with its 4.11 kernel, can run them all (at least currently). It works. That's catching activity from an ls command in another window. See the earlier section for other useful commands. We can ignore this error, because netperf is optional—it's just used for tests—and bcc will compile without it. This was a quick tour of the new BPF performance analysis superpowers that you can use on the Fedora and Red Hat family of operating systems. I demonstrated the popular bcc frontend to BPF and included install instructions for Fedora. bcc comes with more than 60 new tools for performance analysis, which will help you get the most out of your Linux systems. Perhaps you will use these tools directly over SSH, or perhaps you will use the same functionality via monitoring GUIs once they support BPF. If you need to develop custom tools, you can do that with bcc as well, although the language is currently much more verbose than SystemTap, ply, or bpftrace. My bcc tools can serve as code examples, plus I contributed a tutorial for developing bcc tools in Python. I'd recommend learning the bcc multi-tools first, as you may get a lot of mileage from them before needing to write new tools. You can study the multi-tools from their example files in the bcc repository: funccount, funclatency, funcslower, stackcount, trace, and argdist. Thanks to Opensource.com for edits. Brendan Gregg - Brendan Gregg is a senior performance architect at Netflix, where he does large scale computer performance design, analysis, and tuning. Really nice article. Now I have something to play with. I got to the first tool, installed it, and spent the past day and night fixing the horribly inefficient programs I wrote for my system. Not sure how I feel about the time spent, but I sure as hell learned a lot about DBus.